Have you ever been to Hong Kong? It is an amazing place full of sky scrapers and more than seven million people. It is busy, humid and, at times, manic where you can shop until 10 pm seven days a week. In Hong Kong you will find every designer shop you can think of. You will also find some of the best hotels in the world close to street markets which come alive at night. It was in Hong Kong, two years ago, that I spotted the single brown Tyvek® bag which first gave me the idea to set up BO-BORSA I knew the moment I set eyes on this bag that it was a winner. I saw the potential at once. My first aim was to design and produce a range of BO-BORSA bags using brown Tyvek® which looks and feels just like brown paper. The idea of making a bag or light luggage which looked like paper was quirky and original. Within a year we had our first range and had exhibited BO-BORSA at fashions shows in London, Paris and Milan and the response was fantastic. Never before have I experienced so many people being so enthusiastic about a brand new line. As well as being extremely lightweight and looking as though they are made of paper our BO-BORSA bags are incredibly strong. They are almost impossible to tear, are waterproof and washable. They will resist almost any oil or chemical and will wipe clean. Our bags are UV resistant so that they will never be damaged by the sun. But, above all, they are 100% recyclable. 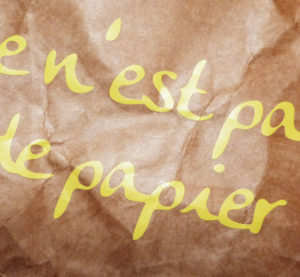 We began with one range in plain brown and another with a ‘ce n’est pas de papier’ logo. In time we plan many more designs and logos. Maybe you could suggest how we might print our bags or what colour you would like most? So, Why Should You Buy a BO-BORSA Tyvek® Bag?